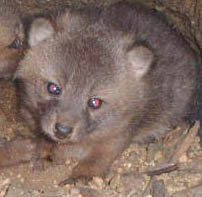 Friends of the Island Fox announces the birth of Tani, a special island fox pup on Santa Cruz Island. More on Santa Cruz Island. This island fox pup will have a voice through Friends of the Island Fox. You'll be able to follow Tani's adventures on Twitter at @ifoxtweet. See the Twitter box in the right hand column below the island fox picture or follow on the Friends of the Island Fox FaceBook page. Over the next year this island fox will tweet her experiences as she grows up and explores her island home. Today Tani and her brother and sister were born in a hillside den. They are each about the size of two AA batteries. Sleep and food are their primary interests and their world revolves around their mother. Follow @ifoxtweet on Twitter as an island fox grows up. Spring is blooming across the Channel Islands. 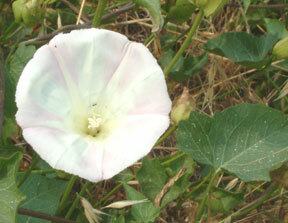 The mountain morning glory unfurls its white flowers tinged in pink. In protective dens across the islands, female island foxes are giving birth to their litters of pups. The green hillsides with their flowers hint that the rainfall has been good this year. If the plants are healthy they will produce abundant fruit this summer. The Catalina cherry, toyon and prickly pear cactus are all important food sources for the island fox. Island fox food. 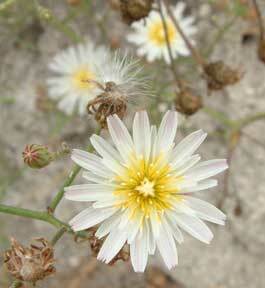 If the plants grow well, the animals that depend on them will do well too. Last year the drought impacted island foxes. Fewer pups were born and many were underweight. This year we are hoping for healthy island fox pups. Typically island foxes have 2 pups, but if there is abundant food they can have up to 5 pups. 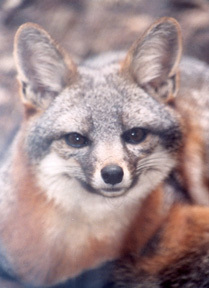 Representatives from Friends of the Island Fox were out on Santa Cruz Island last week. 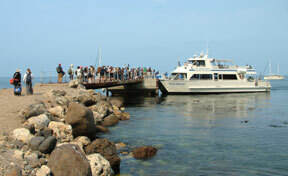 More on Santa Cruz Island. The hillsides were green and the Catalina cherry trees were covered in blooms. We’re looking for a special island fox pup to be born that will be communicating out to the world about its daily life as it grows up. Are you ready to follow an island fox pup as it grows up?